7 Eye Brush Set designed to get a professional looking application every time with Ease! Your eyes are the centre of your inner beauty. They’re also the most vulnerable to harsh chemicals and products than any part of your face. You’re going to be using these applicators in and around your eye. At Nanshy, we know Eye Makeup Brushes need to be safe for you. And apply make-up with ease to enhance that beauty. Health, Beauty, and Ease – Nanshy Eye Brush Set have it all. There are no trade-offs. This set of Nanshy eye brushes features high quality, synthetic, vegan, cruelty free, antibacterial brushes that give you a flawless application! Approved by PETA.org because they’re 100% Vegan, and Cruelty Free! Professional quality brushes for your eyes, brows and lips too, if you like. The Nanshy Eye Brush Set features specialised design, in shape and contour, seven (7) distinct makeup brushes for creating your polished, complete, and natural look! Any level of artistry, this cosmetic brush set will make an immense difference in your make-up application. Made from synthetic hair, on extremely comfortable handles, the bristles are silky soft on top, yet durable firm on the bottom. Our brushes keep more than bristles and errant makeup out of your eyes because they’re antibacterial. And easy to keep clean, you’ll find it’s very elementary to do. Simply hand-wash with mild soap or shampoo, rinse, air dry. With minimum shedding before, during or after washing. Precise Bent Eyeliner Brush – Applies eye-liner just the way you want it, no more, no less! Angled Detailer Brush – Hard to reach areas are no more! Thanks to bristle-design and sturdy handle. Flat Definer Brush – Wide even strokes or turn for long thin strokes, even consistent application. Blending Eyeshadow Brush – Smooth application, pigment clings to your sensitive skin, not the brush. Eye Crease Brush – Precisely applies & blends shadow into your crease for added depth effect. Tapered Crease Brush – Your eyes will pop, enlarge by soft blend of shadow. NO ANIMAL TESTING! All our brushes including this Eye Brush Set are synthetic and Vegan – Nanshy.com is a proud member of People for the Ethical Treatment of Animals – PETA.org and is against cruelty to animals. Brushes arrive boxed and secured in blister tray. Each brush is separated to avoid scratches, dents and other damages. Thanks Sam:) we are looking forward to your review! Price will be revealed soon. Sign up above for exclusive introductory price that will only last few days. You will also be the first to know the release date. Absolutely love these brushes. 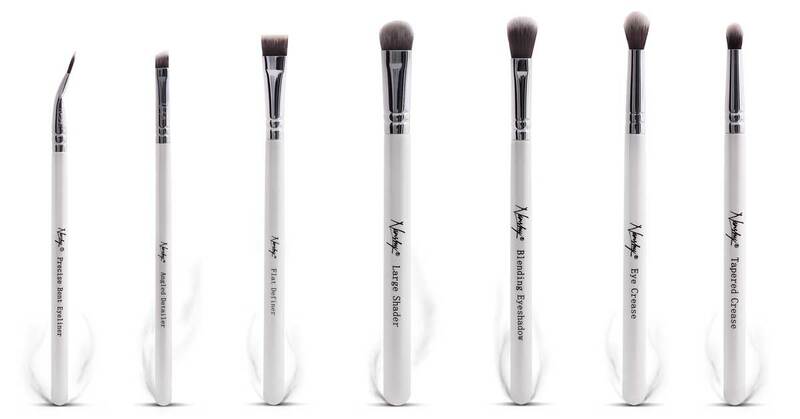 They are on par with my Sigma Bunny Collection brushes and practically half the price! I was eagerly anticipating the release of this set and wow, they don’t disappoint! Another amazing set of Nanshy brushes!